I will be the first to admit this is not the project for you if you’re looking for a cutesy Christmas craft to send home to parents. We do have some adorable Christmas craft ideas if that’s what you need at the moment. 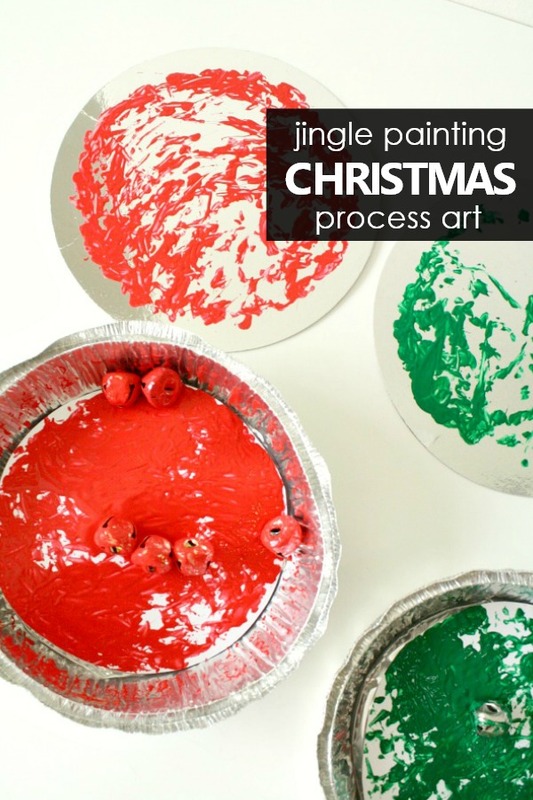 But this jingle bell painting Christmas process art project isn’t for the parents. It’s for the kids! 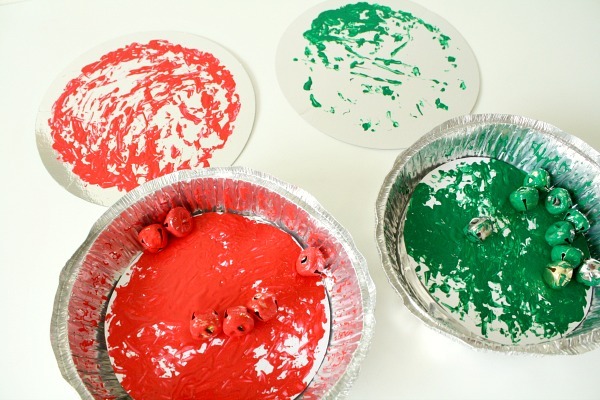 In this process art activity kids get to take the lead on creating, and they get to move and shake as they create their own art with jingle bells. If you’re used to doing adult-led activities and crafts the idea of process art may be new to you. Here’s a super quick overview of the concept and where to look for more information. In the process art approach there is more emphasis on the process of creating art as opposed to the end product. Each work is mainly guided by the child’s own decisions and actions, and each finished piece is unique in its own way. Kids are encouraged to try new techniques without fear of it turning out “wrong” or unlike an example. 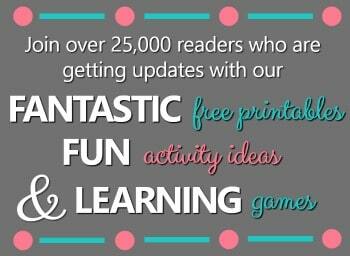 Over on Fun-A-Day Mary Catherine has an excellent article about the how and why of process art. And NAEYC shares some characteristics of process art and tips for implementing process art activities. These books are also excellent resources for incorporating process art activites into your classroom or home. Now back to that jingle bell painting project you came for! 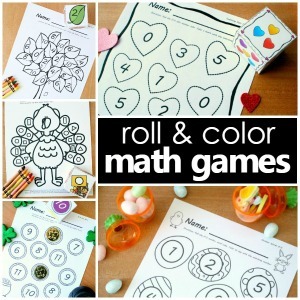 You won’t need a ton of materials for this activity, just a few basic craft supplies. First you’ll need a container to create inside. This can really be anything with a lid that you don’t mind getting paint on. Here we used small pie tins. They come in sets of 3 or so at Dollar Tree. You could also use recycled oatmeal containers. We’ve even used baking pans that have lids before. As always use what you’ve got before heading out to buy something! Then you’ll need something to create on. We used cardstock cut to fit the base of our pans. If you have older kids they can cut the cardstock, but for little ones I go ahead and provide some pre-cut pieces so they can focus on the art. Regular construction paper would also work (but will curl slightly once it dries). And if you save old thin cardboard bits (from things like gift boxes, poster board, packaging, and such) they can be used for this project too. Finally you’ll want to grab some tape, washable paint, and of course some jingle bells. In this quick video you can get a quick glimpse of how one little artist approached this project. We have done this kind of painting quite a few times before (with the jumping jelly bean painting being an all time favorite! ), so the kid already had a general idea of how they’d approach their creations. I did not give much direction aside from making sure that they knew how to secure the lid…nobody wants paint and jingle bells flying across the room! Note that in the video she chose to add only one paint color per pie tin…that’s because she learned a while back that combining a lot of colors almost always ends up with some sort of brown creation. However, if I were introducing this to a new group of kids I would not require only one paint color. Perhaps suggest two if you don’t want kids using every paint color, but do give them the freedom to experiment and make these color mixing discoveries. The pie tins we used have solid lids that actually turn into a second piece of art…one of the reasons I love them. 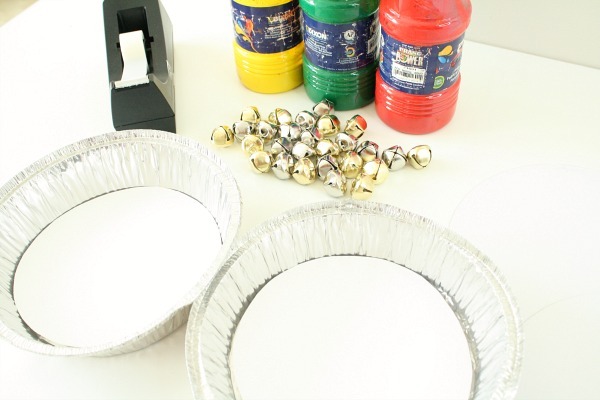 However, this type of project can also be fun to do with a see through lid, because kids can see the jingle bells bounce around instead of just feeling and hearing them. As you choose your container to use for the activity be mindful of this distinction. And perhaps try the other version another time! When I do introduce this type of project to kids, I do let them know that they are welcome to shake, sing, and dance as they create. This is one of the main aspects that makes this art project so fun and memorable for kids. Sometimes we’ll prep just a couple of pie tins and stand in a circle. Then we’ll sing as we shake and pass the pie tins. Other times I’ll work with a small group of kids and we’ll each create a pie tin and then sing and shake together. 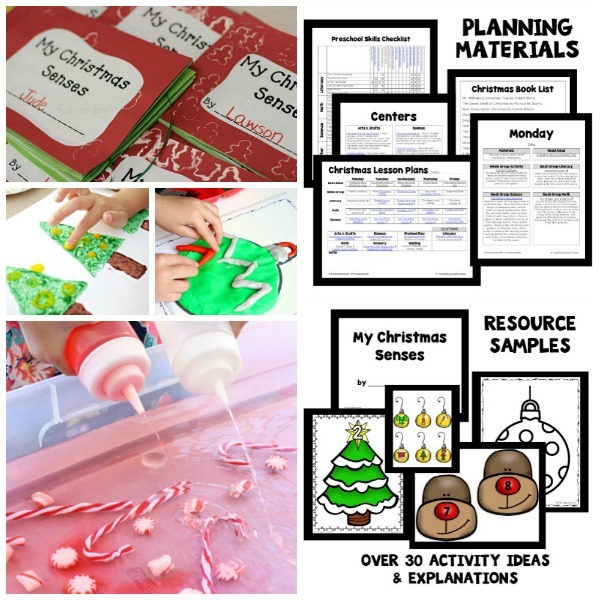 If your kids are used to independent art projects and handling their materials, then you can also set this up as an open choice art center activity. 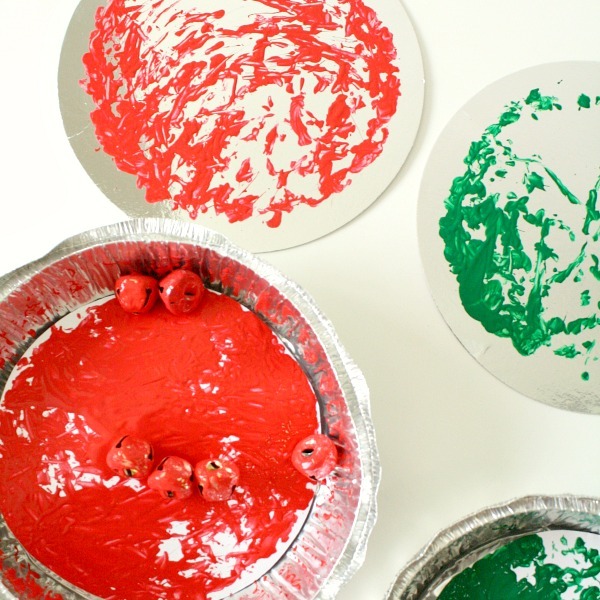 Kids can reuse the pie tins and have a variety of pre-cut papers to create on. As I said before the focus here is on the process. However, when possible I like to incorporate the kids’ creations into something. It can be as simple as hanging them on display so they can observe the similarities and differences. Sometimes we’ll string creations like this one together to make a garland. You can even add a letter to each piece to make a seasonal holiday banner. Just thinking that the paint would pretty quickly clog the bell and stop it from jingling. Did you have this experience? If you use the same bells for multiple creations, I’d suggest thinning the paint a tiny bit with water…not too much but just a bit should help prevent some of the clogging. We also put our bells in a bin of water for some sensory play and a good cleaning once we were done.